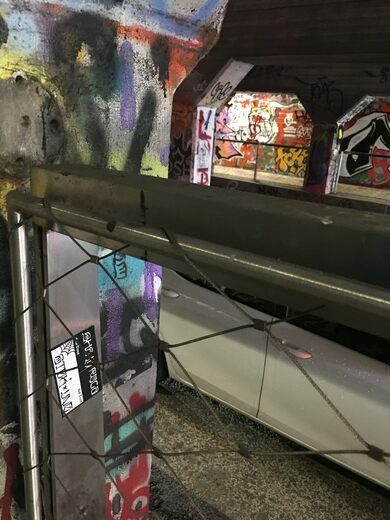 Most urban tunnels and viaducts have their fair share of graffiti, but Atlanta’s Krog Street Tunnel no longer has an inch of unpainted space. The short underpass connects the Atlanta neighborhoods of Cabbagetown and Inman Park, attracting residents from both sides who are looking for a place to make their mark with street art. From small tags to huge murals to underground festival flyers, the concrete walls and pillars of are a chaotic kaleidoscope of overlapping and ever-shifting images, words, and ideas. People have even spray-painted marriage proposals on the walls. The graffiti is so well known and so often updated that there are even websites that post an image a day from the Krog street underground.